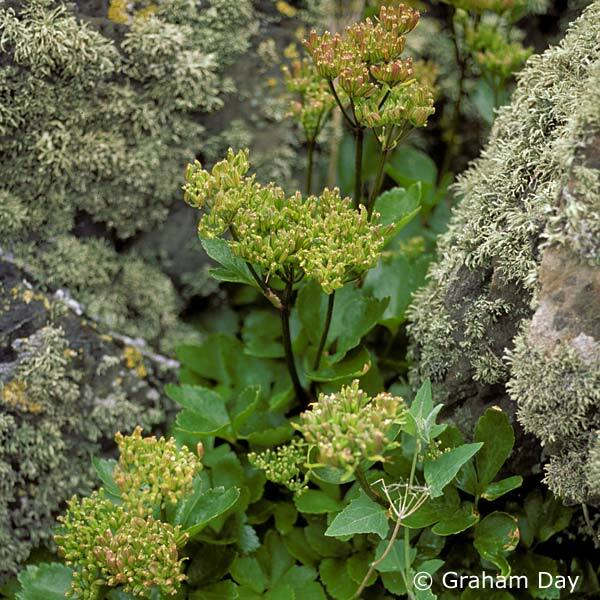 Scots lovage (Ligusticum scoticum) is an arctic/subarctic coastal species of shingle, sand dunes and rocky outcrops, found on both sides of the North Atlantic. The European population reaches as far north as latitude 70°N (Norway). The most southerly European populations are recorded from County Down at about latitude 54° 30'’ N (Ballyhalbert). 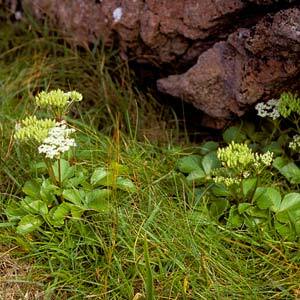 A closely-related species, Ligusticum hultenii, which is perhaps merely a subspecies of L. scoticum, occurs in northern Asia and Alaska. Losses in County Down have been caused probably by climatic changes and perhaps some habitat destruction. A perennial herbaceous plant of the umbellifer (carrot) family, growing up to about 45cm tall and with a single main root extending deep into the soil. Small white flowers are arranged in umbels typical of the family at the top of stiff, purplish stems. The leaves resemble the smaller leaves of Alexanders (Smyrnium olusatrum) and smell of celery or parsley if crushed. The flowers are followed by oval ridged two-seeded fruits which are reportedly capable of floating in sea water. 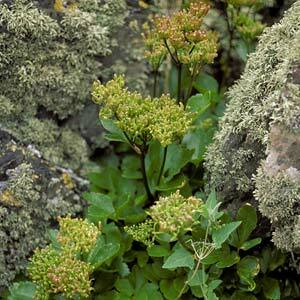 Details of the life cycle are taken from work on Scots lovage populations by M.A. Palin. The plants die back each winter to ground level: new leaves and shoots are produced from the stock and begin to grow in spring. Flowers, which provide nectar, are produced in June to July. They are pollinated by a variety of nectar-seeking insects including hoverflies and other Diptera, and are succeeded by oval 2-seeded fruits which are ripe by October to November. Good seed-set is normal. Seeds are dispersed by wind or sea water and can retain viability even after a year in sea water. Good germination rates require a prior cold, moist period of three months – this may be a factor limiting Scots lovage’s southern range. 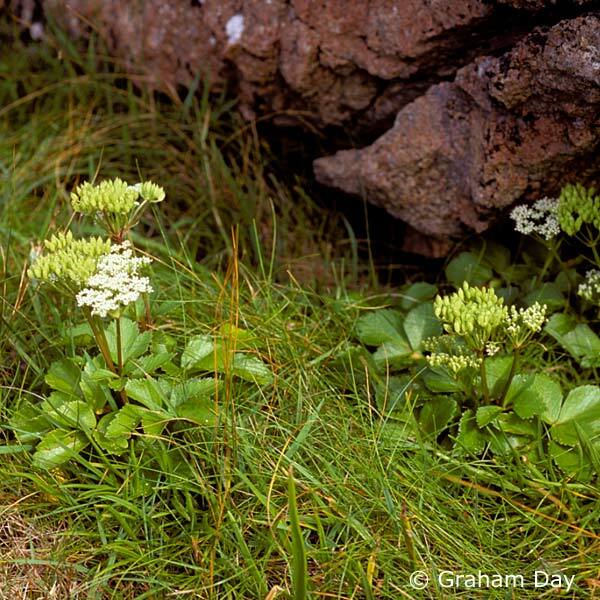 There are no species with which this plant could be confused when fully developed, but small, young, non-flowering plants of Alexanders have been mistaken for non-flowering plants of Scots lovage. Scots lovage is recorded from many sites along the north coast which are probably the easiest to access and visit, especially those on the upper sea shore at Portnaboe, west of the Giant’s Causeway. To see the plant in flower or fruit, visit the sites from midsummer onwards. Relevant access permissions should always be sought prior to visiting any sites. The majority of recorded sites in Ireland lie within Northern Ireland, but since the 1930s there appears to have been a loss of its most southerly sites in the Ards Peninsula in County Down, and of its more southerly sites in County Antrim. One of its 1960s sites in the Ards peninsula has also been lost. In summary, the species has been reported from only 25 per cent of its recorded sites since 1986; the remaining 75 per cent of sites have no report later than the 1960s. It is listed as rare in the Irish Red Data Book (1988). It is recorded from four Irish counties: Donegal, Londonderry, Antrim and Down. Why is this species a priority in Northern Ireland? 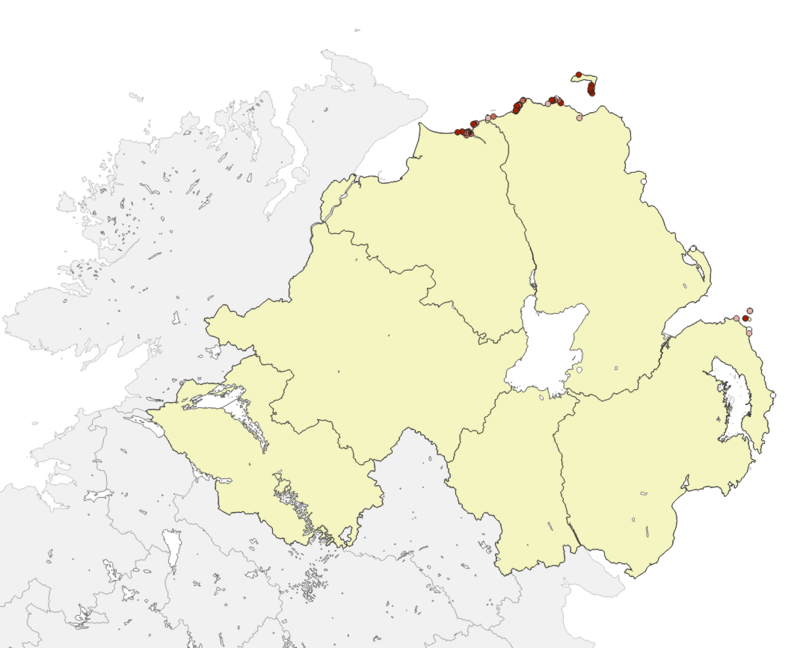 This species is rare, in decline, and Northern Ireland is the stronghold for the Irish population. Climatic changes associated with increasing dryness at critical periods which adversely affect germination may be a factor, together with general warming of the Irish Sea basin causing a retreat northwards. However, the species can be readily overlooked at its more inaccessible cliff sites. In the Republic of Ireland, trials on ex situ cultivation for conservation purposes are being carried out at Glenveagh Gardens, County Donegal. If refound on historic sites, ensure that the population is maintained. Records of the sites where you see this species are important, especially if you find it in one of the old sites from which it has not been recorded recently. Searches in the southern parts of its old range would be very useful. Send any records to either Botanic Society for the British Isles (BSBI), c/o Botany Department, National Museums Northern Ireland, 153 Bangor Road, Cultra, Co. Down, BT18 0EU or to CEDaR, National Museums Northern Ireland, 153 Bangor Road, Cultra, Co. Down, BT18 0EU, Tel: 028 9039 5256, cedar.info [at] nmni.com. Day, G. and Hackney, P. (2004). County Down Scarce, Rare & Extinct Vascular Plant Register and Checklist of Species. National Museums and Galleries of Northern Ireland. Hackney, P. (1992). Stewart & Corry’s Flora of the North-east of Ireland, 3rd edn. Institute of Irish Studies, Belfast. Palin, M.A. (1988). Biological Flora of the British Isles No. 164: Ligusticum scoticum L. Journal of Ecology 76: 889-902. Preston, C.D., Pearman, D.A. and Dines, T.D. (2002). New Atlas of the British & Irish Flora. Oxford University Press/DEFRA.